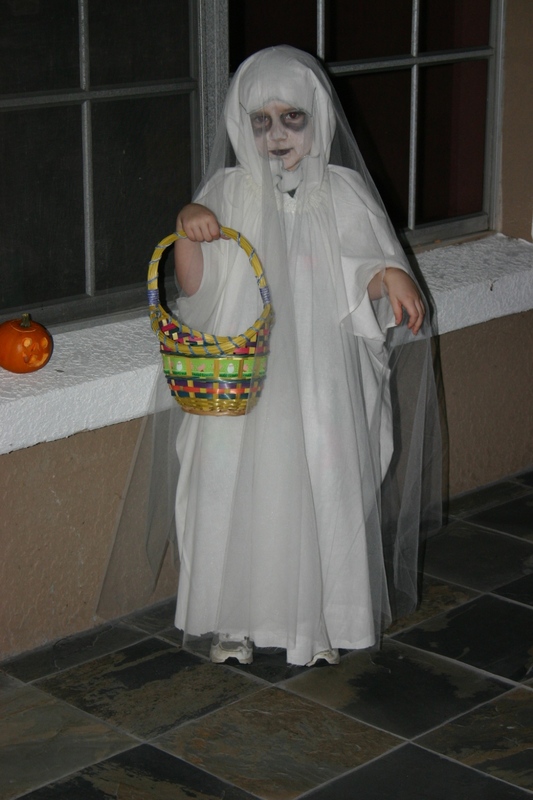 I had to rush on Girly’s costume… unpacking has kept me very busy for most of the past week. I threw this together Saturday morning, before heading out to Rachel’s wedding. My Girly has watched enough fittings to know the drill and she politely but *very* specifically instructed me on how she wanted her costume to look. The first BIG requirement was that it had to be “whitish clearish” and not just white… the tulle layer did the trick and she told me happily “it’s nice and floaty.” She stood nicely while I trimmed the hem to a manageable length and let me recut the eye holes multiple times (and ultimately let me open up the whole face and just add makeup) so that it would be easy for her to see. Not bad for a rush job; next year we’ll see if I can devote a tad more time to it! St Patrick’s Day is just around the corner, and that means corned beef, green beer, and of course, a big annual parade! One of my favorite krewe clients commissioned me to make a new costume for this year’s St Patty’s Day parade, and here it is for your enjoyment! 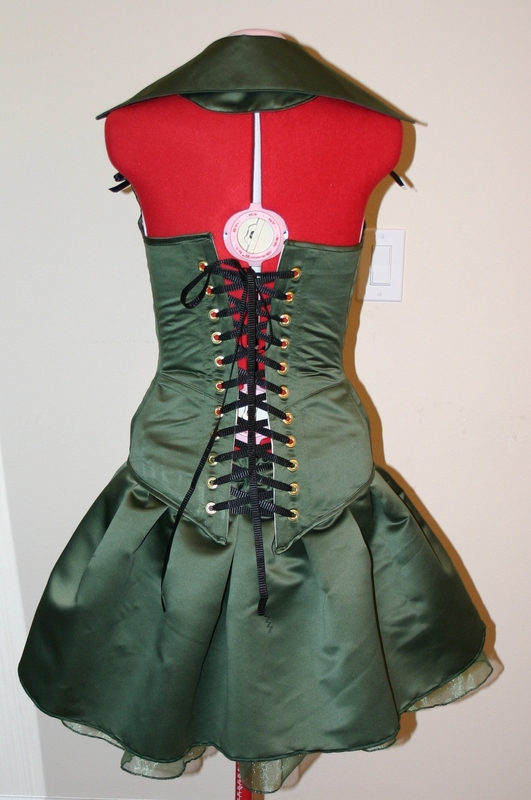 In early December one of my regular clients commissioned me to make this costume for her to wear to a Christmas themed costume party. She went as “Mrs. 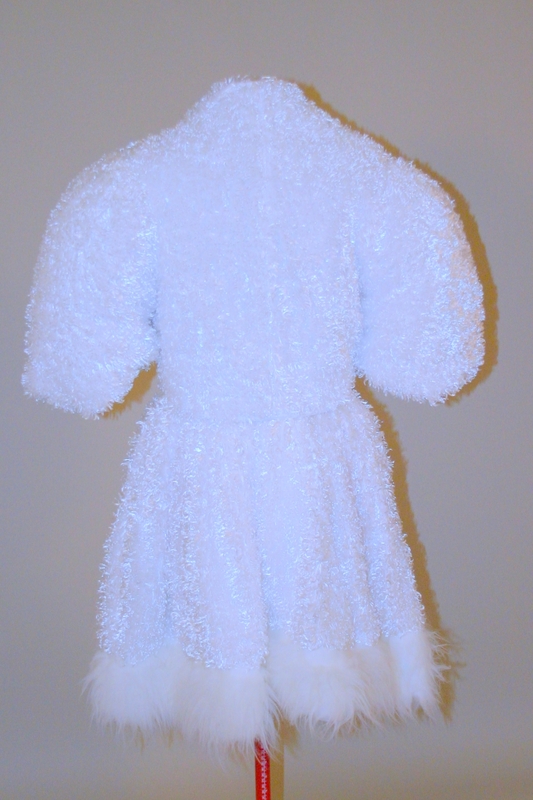 Frosty” and wanted her costume to be voluminous, a puffy white impression of a snowwoman. I made the very full skirt and bolero from white faux fur fabrics, and she wore them over a dramatically full white petticoat and a white and silver tight lacing corset. To create the full, rounded shape she wanted for the bolero, I actually stuffed the sleeves with scraps of petticoat netting! Granted, the photo above is fairly stark. This is our “Before” picture. Yesterday, I dyed. Dying is always a little exciting for me. Plain white turns to brilliant colors, and sooo many details can impact how well the end product turns out. I’ve been playing with dyes for quite a while now and I’m still learning new things I can do. Stove top dying is my usual MO. It’s relatively convenient to set up and clean up, and you can get a nice hot heat on the stove which helps the dye set brilliantly. I’ve learned though that it’s a poor choice for larger projects because even in a 2 gallon stock pot, a couple yards of fabric get crowded quickly – and then you end up with an uneven dye job (not good). Yesterday I wanted to avoid the hassle of dying in the washing machine, but I didn’t want to risk blotchy fabric. So in a moment of inspiration I decided to cut my fabric pieces out first and dye them pre-cut, just a few at a time! (Since the nylon Lycra blend I was working with was a knit fabric, I didn’t have to worry about it fraying after I cut it). It worked superbly. First a shot of my practice swatches as I perfected the color mix in my pot. Attempts 1 through 3 are laid out from left to right, with the farthest right swatch being the purple chiffon fabric I wanted to match. (Actually, I wanted the Lycra to be just slightly darker than the chiffon). And with those components – the hand dyed Lycra and ready chiffon triangles, I was ready to put together a beautiful dress. The built-in body suit went together with no problems whatsoever: front to back, elastic through the legs, bra cups sewn in place. Then the outer dress – front to back, serge the raw edges, leaving a slit up each side which had to be hemmed. I was making great time! Thought I might even finish the dress before bedtime. On to the hem at the bottom. Fold, press, stitch, right? *Shakes head. * If I had taken the time to set up my professional quality iron this wouldn’t have happened. I have a beautiful gravity feed iron with a Teflon shoe that doesn’t melt fabrics. But, setting this up requires me to drill a hook in the wall from which to hand the bottle of water that feeds the iron. Putting the hook in the wall with any ease requires knowing where our power screwdriver is. I think it’s in one of the boxes in the garage. Probably. And in the meantime I’m using the regular, run of the mill, daily use iron that we’ve had for years. And it MELTED a tiny little spot on the skirt. If you sew, you’ll sympathize. Heck if you do any long, time consuming type of project that can be ruined in an instant, you’ll sympathize. At this point I’d been working on the dress all day. Pattern drafting, cutting, soaking, dying, washing, drying, sewing, serging… melting. I called my husband and asked for his painfully honest opinion. No, I couldn’t cut the hem even shorter (it was super short already). No I couldn’t leave the melted spot there and just pretend it hadn’t happened (not that I really would have considered that option). Yes, I really did need to redo the outer dress. Yes, that really did mean cutting, soaking, dying, washing, drying, sewing, and serging all over again. It was one of those gut wrenching, tear jerking, frustrating moments that are just kind of sickening. Acknowledging that a two second error, just that tiniest moment of leaving the iron in one spot too long, was going to cost me HOURS to repair. I balked. I whined. I contemplated crying. And then I took a deep breath and put the stock pot back on the stove. More water. More salt. More dye. More heat. More test swatches. More precut fabric. More rinses. More washing. More drying. More sewing. More serging. And somehow a few hours later I’d caught back up. I was tired but optomistic once again. I could look at the *new* outer dress, smile at my success, and even admit to myself that the dye turned out better the second time. And I got to move forward. Here she is, all finished and just waiting for some bling. (I’ll be gluing around 15 gross of Swarovski rhinestones all over the place once the stones arrive). I promised before that I would post again with some of the costumes I created for this year’s Renaissance Festival. At long last here is one maiden wearing the fine garments I was able to make for her! The full length skirt for this ensemble was made from a brightly colored woven cotton fabric that’s comfortable and cool. It has a gathered elasticized waistband. Her chemise is made from white cotton muslin. It’s a short chemise, coming just past the waist, with three quarter sleeves and a gathered neckline. The shorter lengths are ideal in the blazing Florida heat. 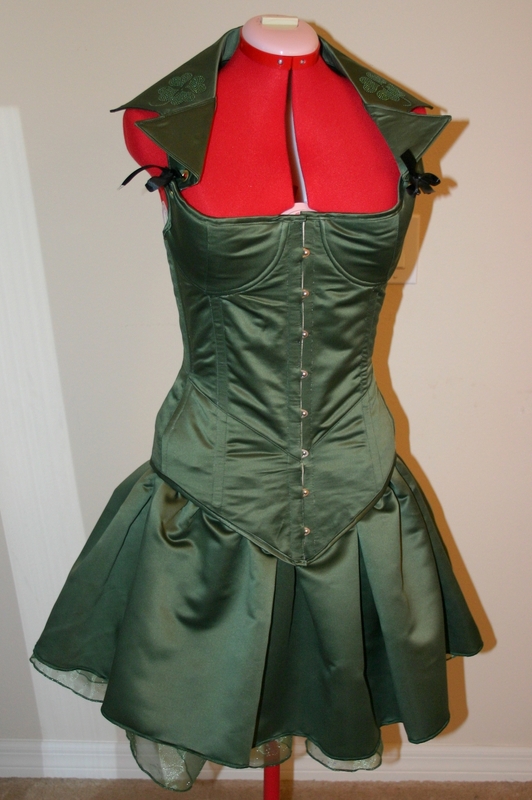 The crowning jewel of the costume is the gorgeous Victorian style overbust corset. Made from soft crushed velvet over a sturdier support fabrics, her corset is both beautiful and durable. 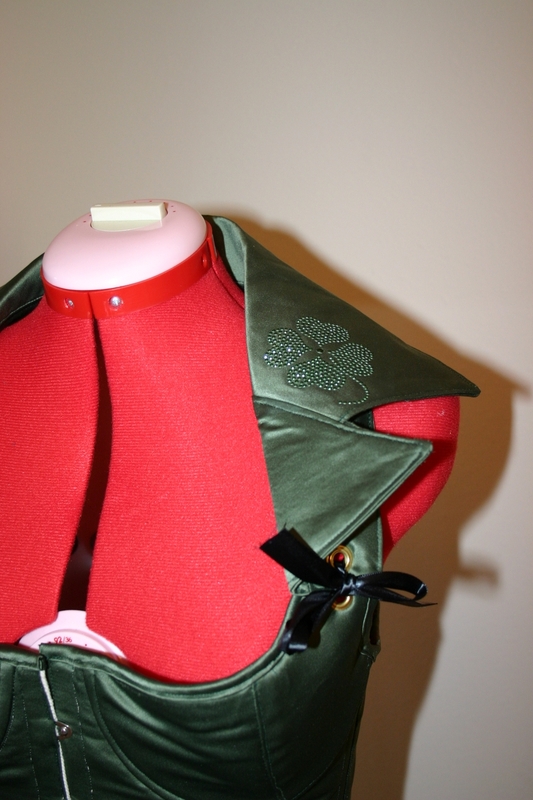 Inside, the corset is reinforced with 20 pieces of thick steel boning for a supportive fit and beautiful shaping! The back is studded with closely spaced steel grommets to allow tight lacing and a snug fit.